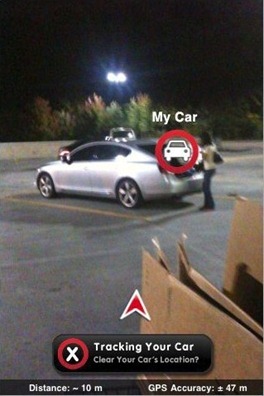 Car Finder has to be one of the most useful augmented reality app to hit for iPhone 3GS. This app uses the built-in GPS and Compass in iPhone 3GS to locate and track the car you have parked from anywhere you are. Now before going into detail on how this app actually works, lets first take a look at what “Augmented Reality” really is. Augmented reality (AR) is a term for a live direct or indirect view of a physical real-world environment whose elements are merged with (or augmented by) virtual computer-generated imagery – creating a mixed reality. The augmentation is conventionally in real-time and in semantic context with environmental elements. It can also be described as the use of transparent HMDs (Head Mounted Displays) to overlay computer generated images onto the physical environment. Precisely calibrated, rapid head tracking is required to sustain the illusion. In modern day combat aircrafts, these computer generated images and data for the target are displayed on the cockpit’s transparent wind screen for pilots while they are still looking into the real world. The required data is displayed and merged within the real world background. In short the “Augmented Reality” is nothing but to augment the real scenario with the help of virtual inputs to make it information-wise much better than the real picture available instantaneously that one can see at certain moment. Intridea has launched its latest application which when installed on the iPhone, helps you find your car in a large parking lot with the help of built-in compass, GPS and the autofocus camera in iPhone 3GS using augmented reality, saving you the hassle and trouble of memorizing your car’s last parked position. What Car Finder actually does is that it allows you to find your car by positioning an overlay on top of a live view of what’s in front of you. Once you load this application, you can see the camera view finder to see an overlay where the car is, the direction and distance of its location from your present position. Accuracy of car finder is greatly dependent on the signal strength of your GPS. This is a real cool application but needs an iPhone 3GS running at least iPhone 3.1.x firmware or later. This app has a pretty poor average rating in the app store. There are better apps that don't use AG that get the job done. Maybe this app will be better later.